Reverse Superman™ che sorvola la città con un sorriso determinato e i pugni chiusi nel suo iconico costume con lo stemma rosso e giallo della S e le parole "Canada 2014 15 Dollars"
Superman™ che sorvola la città con un sorriso determinato e i pugni chiusi nel suo iconico costume con lo stemma rosso e giallo della S e le parole "Canada 2014 15 Dollars"
Moneta in argento 3/4 oz 2014 Superman™ Copertina Fumetto: Action Comics # 419 In Action Comics # 419, the story The Most Dangerous Man on Earth Clark Kent is in orbit for the launching of a new satellite, but the moment he sets foot back in Metropolis he sets off a bizarre series of chain explosions. At the same time, a petty criminal, Moe Malloy, pulls a pair of shoes and a gun out of the river and realizes that they have remarkable properties that would make them perfect for an unstoppable crime spree. Superman™ must figure out how to stop the explosions and how these two incidents may be connected. Published in 1972, Action Comics # 419 features a grinning Superman™ with a bustling city below as his cape flutters in the wind. The obverse features the Susanna Blunt effigy of Queen Elizabeth II and the words "Elizabeth II DG Regina" and the artist's initials. The reverse features a Superman™ that appears to rise right out of the coin. Using a colourized Superman™ and by carefully overlapping the figure and the outer edge it adds to the illusion that Superman™ is actually rising above the city seen below. The design uses a classic iteration of his costume and a more classical depiction of Superman's™ features. Superman™ is surrounded by the words "Canada 2014 15 Dollars". 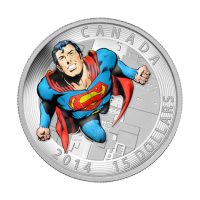 This coin celebrates the iconic art of Superman™ comics since they began in 1938. Made from 3/4 of an ounce of 9999 silver this coin comes encapsulated in a premium graphic case. This coin makes a great gift for coin collectors and Superman fans alike. With a limited worldwide mintage of only 10,000 they won't last long.